If you use sweetened khoya or mawa then you can skip sugar and use less of condensed milk to suit taste too. 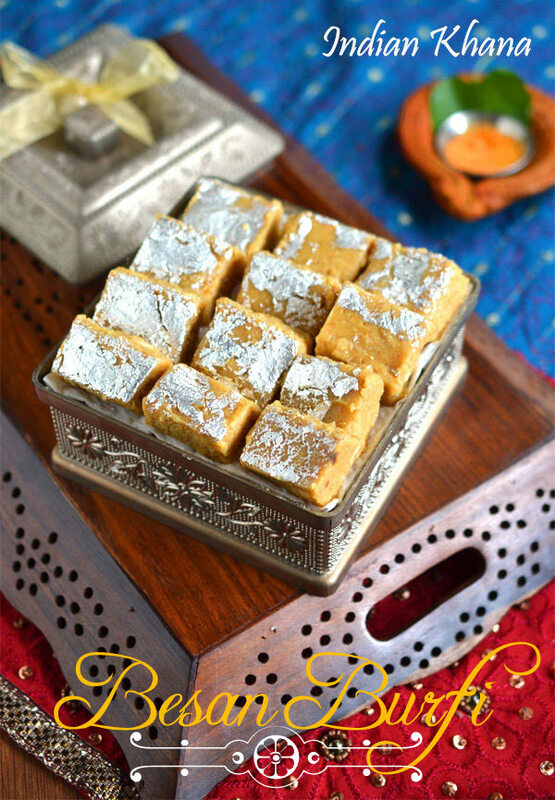 Mawa makes this burfi smooth and add texture to make it more delicious making it perfect for any festival or occasion. If you don't have mawa with you then you can skip that and use of the ingredients and procedure same as listed, it taste delicious this way too. Or instead of burfi roll these into ladoo if prepared, now isn't that wonderful to have so many options with a recipe? 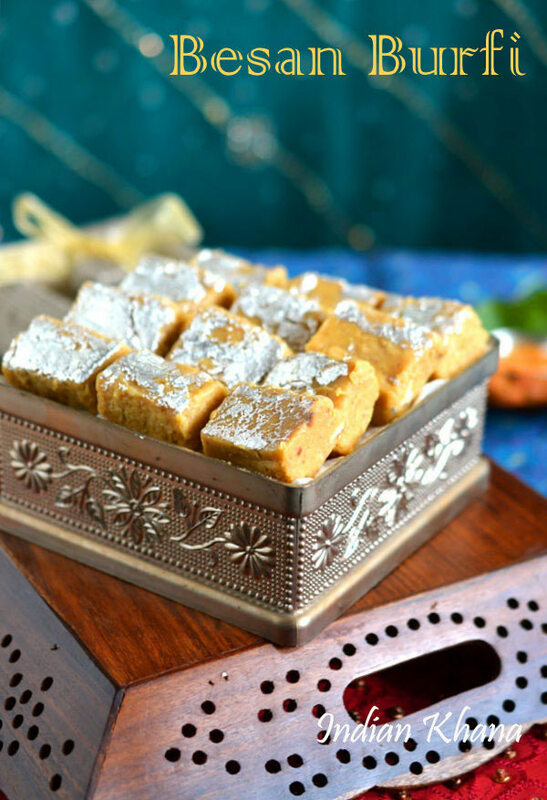 Since Holi is around the corner I am sharing these easy and quick sweet recipes which you can try during holi and enjoy the festive to fullest. 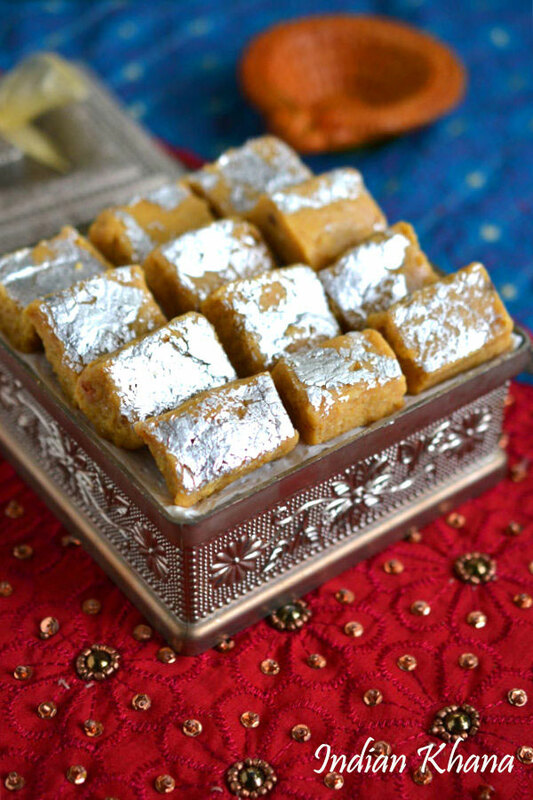 Besan Mawa (Khoya) Burfi is sweet or fudge made with chickpeas flour, milk solid and condensed milk. In a wok or pan heat ghee, add cashew nut pieces and fry until light golden brown, drain cashews and keep aside. In the same pan add besan. Roast besan in slow flame with continuous stirring until it becomes light brown, aromatic and ghee starts to separates off flame and allow besan to cool a bit. 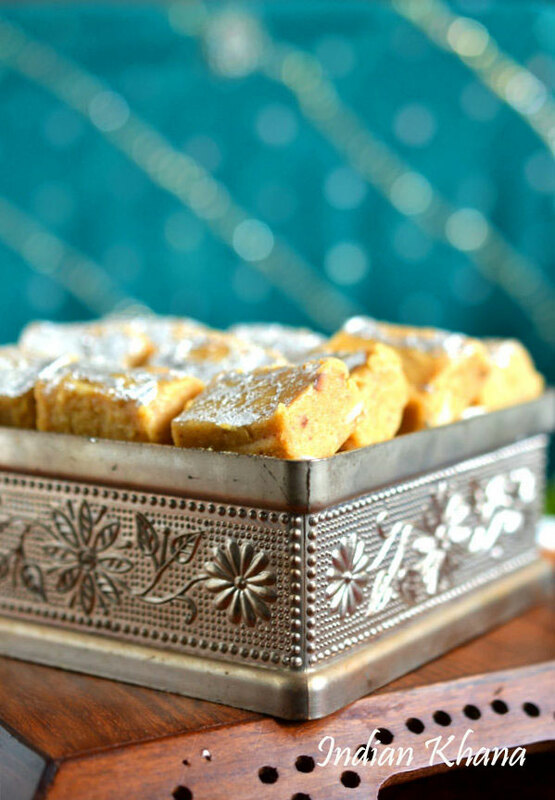 Use a large sieve and sieve through roasted besan to remove any lumps and this also helps to give slight texture to burfi. While besan getting cool, in a pan or wok roast mawa for 2-3 mins or until it gets loosen up, off flame. Add condensed milk, powdered sugar and mix well. Now add cardamom powder, roasted cashew nuts and besan with khoya mixture. Place the wok over slow flame and continuously stir until besan mixture leaves side of pan and not sticky any more as shown in pic below. Grease a plate or pan with little ghee and transfer burfi mixture, level it up even with back of spatula or large knife. If using sliver warq then carefully place the warq on top and allow it to cool completely and then cut in square or diamonds. 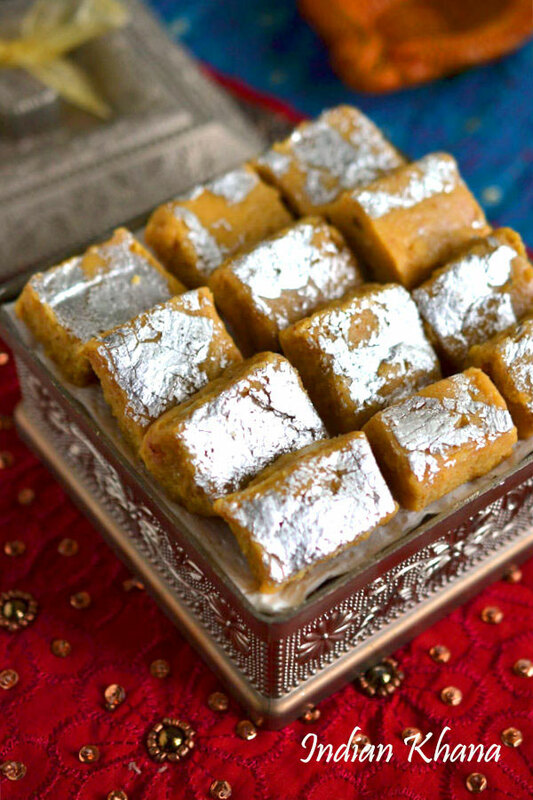 ~ If desire you can keep burfi to cool in fridge for 30 mins to 1 hour too. Store in air tight container and it stays good for 2-3 days. You can add more sugar to suit your taste. If you don't have mawa then add 1 cup condensed milk and adjust sugar accordingly. Roasting besan is important step so do it with care not to burn besan or leave it uncooked. 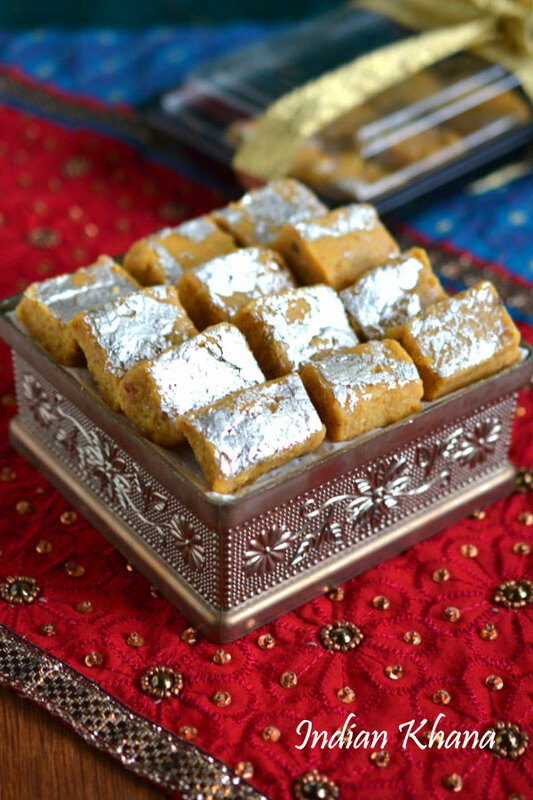 Instead of sliver warq, you can garnish the top with chopped dry fruits, coconut flakes etc.